We’d love your help. Let us know what’s wrong with this preview of Emil and the Detectives by Erich Kästner. A classic and influential story, If Mrs Tischbein had known the amazing adventures her son Emil would have in Berlin, she'd never have let him go. To ask other readers questions about Emil and the Detectives, please sign up. Is this book scary for 7-year-olds? Orinoco Womble (tidy bag and all) No indeed! It's all fun and laughs. I first read it at seven or so and thought it was great. Emil and the Detectives (German: Emil und die Detektive) is a 1929 novel for children set mainly in Berlin, by the German writer Erich Kästner and illustrated by Walter Trier. It was Kästner's first major success, the only one of his pre-1945 works to escape Nazi censorship, and remains his best-known work, and has been translated into at least 59 languages. The most unusual aspect of the novel, compared to existing children's literature at the time, was that it was realistically set in a contemporary Berlin peopled with some fairly rough characters, not in a sanitized fantasy world; also that it refrained from obvious moralizing, letting the characters' deeds speak for themselves. I read this German children's classic while the Greek debt drama of July 2015 was unfolding; I would finish a chapter, go to the Daily Telegraph live blog, catch up on the latest news from Brussels, then return to Emil. The people reporting on the political story were eager to cast the Germans, particularly the hardline Finance Minister Wolfgang Schäuble, as the villains. I read many pieces about how Schäuble was imposing unreasonable and humiliating conditions on the Greeks, and when one looked I read this German children's classic while the Greek debt drama of July 2015 was unfolding; I would finish a chapter, go to the Daily Telegraph live blog, catch up on the latest news from Brussels, then return to Emil. The people reporting on the political story were eager to cast the Germans, particularly the hardline Finance Minister Wolfgang Schäuble, as the villains. I read many pieces about how Schäuble was imposing unreasonable and humiliating conditions on the Greeks, and when one looked at poor Euclid Tsakalotos it was indeed difficult not to feel sorry for him. But as Emil's story progressed, I began to experience an odd sympathy for the Germans. Emil, a bright and responsible eight-year-old, comes from a poor home. His father is dead. His mother doesn't bring in much as a hairdresser, but by planning carefully she is just able to make ends meet and even save a little. She's finally scraped together 140 Marks so that Emil can go and visit his grandmother in Berlin for a week, and both she and Emil are very proud of this achievement. And then, while he's on the train, a heartless thief steals his money. Emil never cries, but he cries now, because he thinks of all the sacrifices his mother made to put that little capital together. And then he moves heaven and earth to get his stolen money back. I watched Schäuble requesting more and more outrageous conditions before he would consent to lend a third tranche of his country's money to Alexis Tsipras, and I suddenly saw him as a small boy reading Emil und die Detektive. He did now just what Emil does in the book: he made contact with a group of like-minded people, got them on his side, encircled the criminal who seemed to be on the point of making off with his assets, and forced him to capitulate. Greece will probably get its loans, but only when they've pledged suitable collateral. It was one of the toughest pieces of negotiation I've ever seen. There's something beautiful and terrifying about that Protestant work ethic. Oh, phew! I was really worried there for quite a few pages. So many aspects of the book are highly realistic, Emil's personality and relationship with his mother, and their money worries, that I was afraid that in the end (view spoiler)[there would be a realistic ending in which it turned out Emil had been mistaken as to the identity of the thief, or as would probably happen in real life the adults would dismiss the boys and the villain would escape unpunished. Thank goodness the children triumph Oh, phew! I was really worried there for quite a few pages. Please note that Emil's exploits, that the story itself, in its German original, while never a personal favourite, is and will always remain a solid three star read for me (enjoyable, but also not spectacular). The above one star rating is simply because the new 2007 translation by W. Martin absolutely and totally leaves so very much to be desired (especially for someone such as I who likes her translations as close to the original as possible and not updated or altered all that much). My review Please note that Emil's exploits, that the story itself, in its German original, while never a personal favourite, is and will always remain a solid three star read for me (enjoyable, but also not spectacular). The above one star rating is simply because the new 2007 translation by W. Martin absolutely and totally leaves so very much to be desired (especially for someone such as I who likes her translations as close to the original as possible and not updated or altered all that much). My review will thus be in two parts (first, general musings on Emil's Berlin escapades as a whole, gleaned mostly from my review of the German original, as the general themes and my issues with some of them remain the same, and then a more in-depth analysis of this particular recent English language translation, and why I personally consider it majorly substandard in every way). First published in 1929, Erich Kästner's Emil und die Detektive (Emil and the Detectives in English translations) especially and brilliantly sparkles and glows with its sense of time and place, with its urban realism, its palpably authentic and genuine representation and description of Berlin (the actual capital city of the Germany of the Weimar Republic, a lively and throbbing modern metropolis, and not some vague environs set in either a magical present or a distant historical past). Also and for me personally, first reading about Emil's adventures and exploits in Berlin, more than forty years later in 1975 (when I was nine years old and approximately a year before we immigrated from what was then West Germany to Canada, and thus in the German original, of course), with the Berlin Wall at that time still firmly in place and East Berlin, like all of East Germany, for all intents and purposes cut off from West Germany, Emil und die Detektive was basically the only way for me to even remotely be able to experience the at that time still former capital of Germany (from 1949 until reunification, while East Berlin remained the capital of East Germany, the capital of West Germany was Bonn), since unless one had family members in the East, it was often very difficult if not impossible for many if not most West Germans to even obtain permission from East Germany to cross over, to visit (and neither did we have relatives in East Germany nor did my parents desire to frequent East Germany as that, according to them, would have been catering to Erich Honecker and the Soviet Union, and even the idea of perhaps visiting West Berlin was never remotely entertained or considered). Aside from the above mentioned and appreciated immediacy, the both harsh and at times delightful reality of urban existence, Emil und die Detektive is primarily a novel of not only adventure and friendship, but essentially, a glorification of children and their abilities, their hidden and not so hidden strengths and talents. Emil and his new friends tracking and then apprehending the scoundrel who had robbed Emil of his money clearly and succinctly demonstrates to ALL (including parents, including adults) that the young are NOT (and should never be) mere bastions of inactivity and quietude (to be seen but not heard, to be sitting silently and attentively at school, at church or at home), but that children can do, that if they join forces and work together, they can (at least within the confines of this story) even take the job of the authorities, of adult detectives (and that there is safety and comfort in numbers, that as a team, collectively, much can be accomplished). That being said, and even though I realise that from all of Erich Kästner's children's novels, Emil und die Detektive remains his most famous and well known (especially in North America and Great Britain, especially in translation), there are some rather major and unfortunate issues with datedness and stratified gender roles present. Emil's female cousin Pony Hütchen (Pony of the Hat), while clearly represented in many ways as both the most imaginative and even the most courageous of the children, unfortunately also seems to be primarily a maternal representative, a motherly type whose role is first and foremost that of a caregiver and liaison (and it is thus Emil and the boys of the group who later earn all or at least most of the accolades, who are feted as having apprehended the thief). Now I do very well realise that Emil und die Detektive was penned, was published in the 1920s and that for its time (for 1929), both the story itself and the featured characters are actually quite if not very avant-garde (even with regard to Pony Hütchen, who while she might indeed languish somewhat as a typical maternal caregiver like entity, is at least permitted, is at least allowed freedom and vitality, is not simply confined to the house or to a finishing school, sewing or learning how to "be a lady"). I just do find it somewhat frustrating that even though many of Erich Kästner's later novels for children often portray considerably less gender stratification (and even actual criticism of the latter), they are often not nearly as familiar and even as available to especially English language readers. Still, Emil und die Detektive remains highly recommended as a story, and is perhaps even a good place to start (especially if one desires to read Erich Kästner's children's writing sociologically and/or historically). I have not, as yet, read the earlier May Massee translation of Emil und die Detektive (but am planning on doing so in the near future, as I have heard very positive critiques of it from trusted GR friends, thanks Cheryl and Michael). Now I do realise that translations are never and can never be exactly like the original (and in fact, translations that strive to be too literal can often have the tendency to read haltingly and tediously, painfully like translations and not as stories, as accounts in and of themselves). That being said, a given translation should still strive to keep as close to the original as possible, mirroring both style and especially time and place of the original narrative (and of course, content and themes as well). And although W. Martin's translation does read fluently enough and yes, even portrays Emil's escapes in Berlin for the most part authentically and realistically, especially his (or her) choice of vocabulary and idiomatic expressions sometimes (often) make me shake my head in consternation (and actually leaves me both frustrated and yes, even rather, no actually very much annoyed). First and foremost (and even in this here new translation), Emil and the Detectives is still clearly presented as a novel set in Berlin, no rather, it is set in 1920s Berlin, and thus it makes precious little sense that so many of the jargon-like expressions used by especially Gus (Gustave) feel more like late 20th, early 21st century vernacular. Sorry, but no one in 1920s Berlin would have called someone dude, nor would the German word Lump have been the equivalent of scumbag in a novel set in 1920s Berlin. I actually rather doubt that scumbag would even have been all that much in existence in the vernacular of most English speaking countries at that time, and in my opinion, the correct, or rather the best translation of Lump should be scoundrel, as scumbag fits neither the time nor the place (and these are just a select few such examples, there are, unfortunately quite a number of them present throughout the translated narrative, rendering the discourse, the textual flow unintentionally anachronistic and to me, unnatural and disconcerting). And the thief who robbed Emil, in the German original he is repeatedly described as a Halunke, which is the equivalent of villain and CERTAINLY NOT jerk as the translator has rendered the former (for the individual who robbed Emil is more than a mere jerk, he is a criminal, a thief, a villain). This is a book that I saw and had to buy and read. It represents a time in my life when I was too busy playing sport or out with mates to read books. I was also lazy and lacked confidence even to read in class but I always liked stories. This was a book that I remember from my youth like, Tom Sawyer and Huck Finn, Brer Rabbit and a wooden horse who collected money somehow and worked down a pit and went to war. Emil and the Detectives was a story that resonated with me, perhaps as it is about crim This is a book that I saw and had to buy and read. It represents a time in my life when I was too busy playing sport or out with mates to read books. I was also lazy and lacked confidence even to read in class but I always liked stories. This was a book that I remember from my youth like, Tom Sawyer and Huck Finn, Brer Rabbit and a wooden horse who collected money somehow and worked down a pit and went to war. Emil and the Detectives was a story that resonated with me, perhaps as it is about crime, perhaps 'cos it is about a group of lads who form a gang for good and although boys will be boys worked together to get a job done. I like that aspect of the story still today. It perhaps doesn't reflect young men at play so much in the 21st century but it is almost ageless in its account of a life from the previous 100 years. It is also exciting as it is set in Berlin, Germany and is a story that could have been equally true if set in England. Written in 1928 it is chilling to think that this was a youth that went on to be soldiers in World War II. শৈশবের গলপগুলো বোধহয় পৃথিবীর সবখানেই এক। সব ছেলেমেয়েরই ছোটবেলায় গোয়েনদাগিরি করার শখ চাপে! হোক সেটা বাংলাদেশ কিংবা জারমানি! শিশুসাহিতয পড়লেই বযাপারটা সপষট ধরা পড়ে! "এমিলের গোয়েনদা দল" গলপের পলটটা খুব সুনদর! লকষমী ছেলে এমিল টিশবাইন কিভাবে মায়ের দেয়া পাউনড হারিয়ে আবার সেটা উদধার করে আর কিভাবে বারলিন শহরের ছেলেপুলেদের খুব বনধু হয়ে যায় সেই গলপ। কিশোর বয়সে সবার সাথে বনধুতব হয়ে যায় খুব সহজে। তা না হলে চেনেনা জানেনা এমন একজনকে সাহাযয করতে গুসতভ এক কথায় রাজি হয়ে যায় কিভাবে?! খুব হমবিতমবি করলেও গুসতভ ছেলেট শৈশবের গল্পগুলো বোধহয় পৃথিবীর সবখানেই এক। সব ছেলেমেয়েরই ছোটবেলায় গোয়েন্দাগিরি করার শখ চাপে! হোক সেটা বাংলাদেশ কিংবা জার্মানি! শিশুসাহিত্য পড়লেই ব্যাপারটা স্পষ্ট ধরা পড়ে! "এমিলের গোয়েন্দা দল" গল্পের প্লটটা খুব সুন্দর! লক্ষ্মী ছেলে এমিল টিশবাইন কিভাবে মায়ের দেয়া পাউন্ড হারিয়ে আবার সেটা উদ্ধার করে আর কিভাবে বার্লিন শহরের ছেলেপুলেদের খুব বন্ধু হয়ে যায় সেই গল্প। কিশোর বয়সে সবার সাথে বন্ধুত্ব হয়ে যায় খুব সহজে। তা না হলে চেনেনা জানেনা এমন একজনকে সাহায্য করতে গুস্তভ এক কথায় রাজি হয়ে যায় কিভাবে?! খুব হম্বিতম্বি করলেও গুস্তভ ছেলেটার মনটা খুব ভাল! তাই এমিল গোয়েন্দাগিরি করতে গিয়ে খরচ হয়ে যাওয়া টাকা ফেরত দিতে চাইলে বলে, "দেয়ার চেষ্টা করে দেখো একবার!" আর আছে মিষ্টি ছেলে টুয়েসডে, বর্ণ লীডার প্রফেসর! First published in 1929, Erich Kästner's Emil und die Detektive (Emil and the Detectives) especially and brilliantly sparkles and glows with its sense of time and place, with its urban realism, its palpably authentic and genuine representation and description of Berlin (the capital city of the Germany of the Weimar Republic, a lively and throbbing modern metropolis, and not some vague environs set in either a magical present or a distant historical past). Also and for me personally, reading abou First published in 1929, Erich Kästner's Emil und die Detektive (Emil and the Detectives) especially and brilliantly sparkles and glows with its sense of time and place, with its urban realism, its palpably authentic and genuine representation and description of Berlin (the capital city of the Germany of the Weimar Republic, a lively and throbbing modern metropolis, and not some vague environs set in either a magical present or a distant historical past). Also and for me personally, reading about Emil's adventures and exploits in Berlin, more than forty years later in 1975 (when I was nine years old, approximately a year before we immigrated from what was then West Germany to Canada), with the Berlin Wall at that time still firmly in place and East Berlin, like all of East Germany, for all intents and purposes cut off from West Germany, Emil und die Detektive was basically the only way for me to even remotely be able to experience the at that time still former capital of Germany (as from 1949 until reunification, while East Berlin remained the capital of East Germany, the capital of West Germany was Bonn), since unless one had family members in the East, it was often very difficult for many if not most West Germans to even obtain permission from East Germany to cross over, to visit (and neither did we have relatives in East Germany nor did my parents desire to frequent East Germany as that, according to them, would have been catering to Erich Honecker and the Soviet Union, and therefore, even the idea of perhaps visiting West Berlin was never remotely entertained or considered). Now aside from the above mentioned and appreciated immediacy, the both harsh and at times also entertaining, delightful reality of urban existence, Emil und die Detektive is primarily a novel of not only adventure and friendship, but essentially, a glorification of children and their abilities, their hidden and not so hidden strengths and talents. Emil and his new friends tracking and then apprehending the scoundrel who had robbed Emil of his money clearly and succinctly demonstrates to ALL (including parents, including adults) that the young are NOT (and should never be) mere bastions of inactivity and quietude (to be seen but not heard, to be sitting silently and attentively at school, at church or at home), but that children can do, that if they join forces and work together, they can (at least within the confines of this story) even take the job of the police, of adult detectives (and that there is safety and comfort in numbers, that as a team, collectively, much can be accomplished). But that being said, and even though I do realise that from all of Erich Kästner's children's novels, Emil und die Detektive is definitely still his most famous and well known (especially in North America and Great Britain, especially in translation), there are some rather major and unfortunate issues with datedness and stratified gender roles present, as Emil's female cousin Pony Hütchen, while clearly represented in many ways as both the most imaginative and even the most courageous of the children, unfortunately also seems to be primarily a maternal representative, a motherly type whose role is first and foremost that of a caregiver (and it is thus Emil and the boys of the group who later earn all or at least most of the accolades, who are feted as having apprehended the thief). I’ve been wanting to read this book since Disney aired its 1964 film version on television when I was a child myself (late 1960s or early 1970s). But I put it off for literally decades until the excellent Manny Rayner reminded me of the book’s existence. How sorry I am that I didn’t read this delightful little book sooner! Considering the book was first released in 1929, this tale of a poor boy who loses a large sum, but is aided in its recovery, has aged magnificently. Young Emil Tabletoe takes I’ve been wanting to read this book since Disney aired its 1964 film version on television when I was a child myself (late 1960s or early 1970s). But I put it off for literally decades until the excellent Manny Rayner reminded me of the book’s existence. How sorry I am that I didn’t read this delightful little book sooner! Considering the book was first released in 1929, this tale of a poor boy who loses a large sum, but is aided in its recovery, has aged magnificently. Young Emil Tabletoe takes a train to Berlin to spend a week during the summer with his grandmother, Aunt Martha, and her family. While on the train, he’s robbed of the 140 marks he’s carrying by a man in a bowler hat, and his adventure in the big city begins. Emil’s newfound friend, Gustav with the bicycle horn, and his pals organize a manhunt that would make the FBI proud. Emil’s cousin also joins in. Author Erich Kästner creates amazingly believable characters — particularly boys thoroughly enjoying being boys like Emil, Gustav, Crumbagel, the Professor, Petzold, grumpy Truegut, and little Tuesday — but also the long-suffering Mrs. Tabletoe and Emil’s smart-alecky grandmother and his bicycle-crazed, feisty cousin “Pony the Hat” Heimbold. I loved every minute of this quick read, which I finished in one sitting. I couldn’t stop reading! First published in 1929, Erich Kästner's Emil und die Detektive (Emil and the Detectives in English translations) especially and brilliantly sparkles and glows with its sense of time and place, with its urban realism, its palpably authentic and genuine representation and description of Berlin (the capital city of the Germany of the Weimar Republic, a lively and throbbing modern metropolis, and not some vague environs set in either a magical present or a distant historical past). Also and for me personally, first reading about Emil's adventures and exploits in Berlin more than forty years later in 1975 (when I was nine years old, approximately a year before we immigrated from what was then West Germany to Canada, and thus in the German original, of course), with the Berlin Wall at that time still firmly in place and East Berlin, like all of East Germany, for all intents and purposes cut off from West Germany, Emil und die Detektive was basically the only way for me to even remotely be able to experience the at that time still former capital of Germany (from 1949 until reunification, while East Berlin remained the capital of East Germany, the capital of West Germany of course was Bonn), since unless one had family members in the East, it was often very difficult if not impossible for many if not most West Germans to even obtain permission from East Germany to cross over, to visit (and neither did we have relatives in East Germany nor did my parents desire to frequent East Germany as that, according to them, would have been catering to Erich Honecker and the Soviet Union and even the idea of perhaps visiting West Berlin was never remotely entertained or considered). Now I do very well realise that Emil und die Detektive was penned, was published in the 1920s and that for its time (for 1929), both the story itself and the featured characters are actually quite if not very avant-garde (even with regard to Pony Hütchen, who while she might indeed languish somewhat as a typical maternal caregiver like entity, is at least permitted, is at least allowed freedom and vitality, is not simply confined to the house or to a finishing school, sewing or learning how to "be a lady"). I just find it somewhat frustrating that even though many of Erich Kästner's later novels for children often portray considerably less gender stratification (and even actual criticism of the latter), they are often not nearly as familiar and even available to especially English language readers. Still, Emil und die Detektive remains highly recommended as a story, and is perhaps even a good place to start (especially if one desires to read Erich Kästner's children's writing sociologically and/or historically). After having been massively frustrated with and disappointed by the recent 2007 W. Martin translation of Emil und die Detektive, I was both looking forward to reading this earlier (and now unfortunately no longer in current print) translation by May Massee and also feeling a bit of, I think, well-understood trepidation. Yes, a number of my GR friends have highly praised Massee's translation of Kästner's classic, but I still was a bit worried; however, I absolutely need not have been. This here translation, May Massee's rendition is, indeed, simply lovely, simply wonderful, in all ways totally and utterly capturing the spirit of the original, of Erich Kästner's original German text whilst also not reading like a literal sentence to sentence translation, whilst presenting a narrative that flows smoothly, naturally, and in no way haltingly. There might be a few minor spelling mistakes, and one or two small instances of awkwardness of interpretation, but the translator (May Massee) has for the most part successfully rendered into English what should be kept English and retained in German what needs to be kept German (such as all of the personal and geographic names and designations). And unlike the 2007 W. Martin translation, which changed so much of especially Gus's (Gustav's) parlance into a rather strange late 20th, early 21st century American street slang (not really appropriate for a novel clearly set in 1920s Berlin), the idiomatic expressions, the slang and discourse of May Massee's translation fit both time and place (and thus also mirror Kästner's original German narrative accurately and very much realistically). Ir tik interesanti pieaugušā vecumā pārlasīt bērnības dienu grāmatas. Šobrīd liekas, ka Emīls ir totāls gnīda, lai gan bērnībā tā nepavisam nelikās. This is more like a review-by-proxy of Emil and the detectives. I watched a program on youtube in which Marcel Reich-Ranicki, without doubt the most famous German literary critc of his time, is talking about German authors; this time about Erich Kästner. Of course he also had something to say about "Emil". Born in Poland in 1920 with a Polish father and German mother, the family moved to Berlin in the late 1920s. Here little Marcel learned to read German. Although he sort of liked the usual books This is more like a review-by-proxy of Emil and the detectives. I watched a program on youtube in which Marcel Reich-Ranicki, without doubt the most famous German literary critc of his time, is talking about German authors; this time about Erich Kästner. Of course he also had something to say about "Emil". Born in Poland in 1920 with a Polish father and German mother, the family moved to Berlin in the late 1920s. Here little Marcel learned to read German. Although he sort of liked the usual books set in exotic places and historic times ("Ben Hur", "Quo Vadis", "Robinson Crusoe", the Karl May stuff, etc.) he was enthusiatic about Kästner's novel for children. This was the very first book, at least in Germany, that is set in a place the children actually know about (Berlin) and at the current time and not in some distant past. The characters in the book speak the same language as the readers, while the story is also believable and understandable. So here's a clear five-star-rating from Mr Reich-Ranicki. Later Reich-Ranicki moved back to Poland and, as a Jew, was held captive in the Warshaw Ghetto. In an antiquarian bookshop he discovered some German books, one of which was Kästner's Lyrische Hausapotheke (Poetic Medicine Chest). He wasn't able (or not allowed) to buy the book, but he could borrow it for a limited time. His then-girlfriend (and later wife) copied the poems by hand, added some images, and gave it to her boyfriend as a gift for his 21st birthday. They both read the "book" many times, while hearing Germans shooting and Jews screaming on the streets of the ghetto. Death was imminent any day. After the war Reich-Ranicki went back to Germany, and eventually became a known figure in German literary circles. In the mid-fifties he met Erich Kästner in Munich for the first time. When he showed Kästner the "illegal" copy of his book that was read in the Warshaw Ghetto the author had no idea that his works (banned and burned by the Nazis) were read outside of Germany during the war. I bet he had to brush away a tear or two. Another case of a pen that is ultimatley mightier than any sword. PS: There was a facsimile edition made from the Ghetto book, and I think I'm going to get me a copy. As funny and delightful as ever. It was one of my favourite comfort-reads as a child and it did not disappoint the grown-up me either. It has everything that a children's book is supposed to have. A simple story, a young boy as the hero who is ably assisted by other young boys, a cunning bank robber who gets nabbed by the young detectives (boys). As the story progresses you root for the small boys and it is a satisfying denouement as the story ends in all positive manner. In it are interwoven some wonderful themes: Love for Parents, Friendship, Honesty, Be careful with the Strangers especially when travelling alone. Along with m It has everything that a children's book is supposed to have. A simple story, a young boy as the hero who is ably assisted by other young boys, a cunning bank robber who gets nabbed by the young detectives (boys). Along with many small boys there is also a small girl in the group. But she is reserved only for the girl things. She brings food for the boys, does the household chores considering it as her heaven bound duty, etc. That is the only drawback. But then, the novel was written originally in 1929. The ideas were very regressive. This is funny and sweet and unexpectedly serious. I think kids would love it. Great illustrations too. There are two things that strike me in particular: the ability and sense of responsibility of the children to organise themselves and the hero's sense of responsibility towards his mother and his family - not surprising given als ich ein kleiner Junge war. It's a simple story of a boy from a small town going to visit relatives in the big city. Entertaining and engaging. The hero's fear of going to the police because he had drawn a mustache on a statue always felt realistic to me as a child. This review is for the wonderful Scholastic edition, not the rotten 2007 edition . GR's stupid software updates have decided that they know better than me. For the review of the horrible 2007 edition, check the Scholastic cover. I tried to fix the confusion and made it worse. Sheesh. This is the translation of Emil that I grew up reading. My brother bought it from Scolastic back in the late 60s and I read it over and over again. Fast forward 3 or 4 decades and I bought it on Amazon. Or thought I bought it on Amazon. Unfortunately it never occurred to me that this classic would be descrated with a "modernised" translation. Published in 1928, the millenial slang the translator and editors saw fit to insert was indigestible to say the very least. Huge thanks to my GR friend Miriam who sent me her copy. I spent the afternoon of a tiring day with a smile on my face, reading it. My eidetic memory rejoiced in every remembered phrase. While travelling by train to visit his grandmother in Berlin, young Emil falls asleep. When he awakes, the money pinned inside his coat is gone, along with the bowler-hatted stranger who'd been sitting across from him. When Emil spots the man getting off the train at another station, he heads off in pursuit. Along the way, he meets up with a group of boys (the detectives) and together they set out to trap the thief. I've been reading a book called '501 Must-Read Books' and when it mentioned 'Emil While travelling by train to visit his grandmother in Berlin, young Emil falls asleep. When he awakes, the money pinned inside his coat is gone, along with the bowler-hatted stranger who'd been sitting across from him. When Emil spots the man getting off the train at another station, he heads off in pursuit. Along the way, he meets up with a group of boys (the detectives) and together they set out to trap the thief. 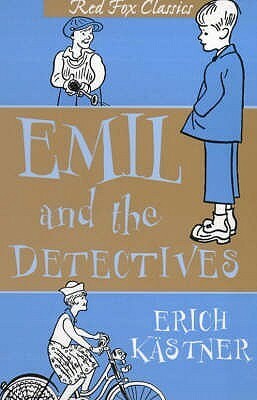 I've been reading a book called '501 Must-Read Books' and when it mentioned 'Emil and the Detectives', my primary school days came flooding back. In a fit of nostalgia, I got the book out of the library. It's a good tale, told with humour and a moral, though not heavy-handed. Emil and the other 'detectives' show a lot of resourcefulness and you feel like cheering for them. As the book was written in 1929, some of the language is of course dated and the only girl in the story has to fetch food, serve hot chocolate and do the dishes (though she does get to ride her nickel-plated bicycle to summon the police). However, in the preface to this edition, Michael Rosen notes that the book was really ahead of its time. It was one of the first child-detective books, predating the Famous Five, Secret Seven and all the child sleuths who followed. It was also one of the first to show a single-parent family where the mother had to work hard to support herself and Emil, thus making the theft even more serious. It's not a mystery as such because there's only ever one suspect, but it was still interesting to see how the boys trapped him and how Emil proved the money was his. The original illustrations and snippets of information about different characters also add to the charm. "Emil und die Detektive" ist natürlich so gut wie jedem ein Begriff, allerdings habe ich die Geschichte selber zum ersten Mal gelesen. Wer bisher so wie ich nur die Verfilmung aus den 90ern kennt, wird wahrscheinlich überrascht sein, dass im ganzen Buch nur ein Mädchen vorkommt, nämlich Pony Hütchen. Anders als im Film ist sie aber nicht das Gegenstück zu Emil, die ihm in Sachen Mut in nichts nachsteht, sondern"bloß" die Cousine, die den Jungs Brötchen vorbei bringt. Natürlich liegt das daran, d "Emil und die Detektive" ist natürlich so gut wie jedem ein Begriff, allerdings habe ich die Geschichte selber zum ersten Mal gelesen. Wer bisher so wie ich nur die Verfilmung aus den 90ern kennt, wird wahrscheinlich überrascht sein, dass im ganzen Buch nur ein Mädchen vorkommt, nämlich Pony Hütchen. Anders als im Film ist sie aber nicht das Gegenstück zu Emil, die ihm in Sachen Mut in nichts nachsteht, sondern"bloß" die Cousine, die den Jungs Brötchen vorbei bringt. Natürlich liegt das daran, dass das Buch fast 100 Jahre alt ist, aber es stört mich trotzdem, dass an dem richtigen Abenteuer nur die Jungs teilnehmen durften. Darum habe ich auch einen Stern abgezogen. Dramatisation by Katie Hims of the comic children's detective novel by Erich Kaestner. Country boy Emil Tischbein, up from Neustadt for the first time, enlists the aid of hundreds of Berlin street boys to help him catch a thief. The introduction to this book confidently tells us how the story has been faithfully translated from German and in no way loses any of the excitement, thrill or adventure had by our main character, Emil. It's right too, because this is a cracking story, first published in English in 1931, of Emil's train ride to visit his Grandmother in Berlin and his subsequent adventure. On the way to Berlin Emil sits next to a man wearing a bowler hat and reading a newspaper....there is something not quite rig The introduction to this book confidently tells us how the story has been faithfully translated from German and in no way loses any of the excitement, thrill or adventure had by our main character, Emil. It's right too, because this is a cracking story, first published in English in 1931, of Emil's train ride to visit his Grandmother in Berlin and his subsequent adventure. On the way to Berlin Emil sits next to a man wearing a bowler hat and reading a newspaper....there is something not quite right about him....after nodding off to sleep because of the rhythm of the train, Emil awakes later to find both the carefully concealed money he was taking to his Grandmother and the man in the bowler hat.... gone. Ach Erich Kästner ist schon ne knorke Autor, nicht? Ich liebe einfach seinen Schreibstil, weise und witzig und mit soviel Herz! Emil und die Detektive ist eine wunderbare Geschichte voller Freundschaft, Abenteuer, Mut und Bescheidenheit! Let me be clear: I am not giving one star to Erich Kastner's original, marvelous book, one of my childhood favorites. You can find that here. I am giving it to this "updated" translation, which tries to make Emil and his friends talk like 21st century kids, and gives English versions of many of the names. Emil Tischbein becomes "Emil Tabletoe," poor Pony Hutchen becomes "Pony the Hat," and Gustav is renamed "Gus" and declares "I'm pysched!" at one point. Not me. I'm not psyched. I am, in the word Let me be clear: I am not giving one star to Erich Kastner's original, marvelous book, one of my childhood favorites. You can find that here. Not me. I'm not psyched. I am, in the words of a Bloom County character, "Appalled with 3 'P's." Erich Kastner had written Emil and the Detectives originally in German. The book was very popular. But during Hitler's time, his books were branded anti-german and several copies consigned to flames. Luckily, the book outlasted those dark times and Emil survived to spy another day. Emil is one of the first fictional child detectives. Today, we have 'The Famous Five', ' Alex Rider', 'Nancy Drew... But little Emil was the first. Philip Pullman remarked that the book is ' democracy in action' and Erich Kastner had written Emil and the Detectives originally in German. The book was very popular. But during Hitler's time, his books were branded anti-german and several copies consigned to flames. Luckily, the book outlasted those dark times and Emil survived to spy another day. Emil is one of the first fictional child detectives. Today, we have 'The Famous Five', ' Alex Rider', 'Nancy Drew... But little Emil was the first. Philip Pullman remarked that the book is ' democracy in action' and he is right. Emil and his friends co-operate with each other, stick together and contribute to the decision making process, ultimately leading to the thief's capture. Emil and the detectives is set in the good old world, when things and people used to be a lot less complicated and kids were just kids. The book is awash with the rustic charm of the countryside, the maddening excitement of a teeming city and the cozy warmth of unadulterated affection and companionship. When Emil realises that he has been robbed of the seven pounds that his mother had toiled hard to earn and which she had entrusted to his safekeeping, he does not think twice before deciding to pursue the thief, inspite of being aware of the dangers the chase might lead him to. But he was in for the biggest surprise of his life when a whole herd of Berlinese boys join him in his mission and pledge their unstinted support to regain his money. From then on, it is fund unlimited for Emil and the boys. One cannot help but smile at the utter seriousness with which the kids plot their strategy. They pool their money, stock food, engage messengers, devise passwords to prevent unauthorised and illegitimate access to their classified plans and spy in disguise. And of course, at the end Emil and his group is mightily rewarded for the thief's capture. And to think that these boys grew up to serve the Führer. But I'll try to set that thought aside. A classic that doesn't age well. Pony, the girl cousin with the bicycle, is the most energetic and brave of all, but is delighted to be the one to make coffee and serve rolls to the boys, and to serve the cause primarily as liaison to the adults. The boys have entirely too much freedom... the 'sensibleness' of the more liberal parents is explained frighteningly convincingly. And there's so much good And to think that these boys grew up to serve the Führer. But I'll try to set that thought aside. A classic that doesn't age well. Pony, the girl cousin with the bicycle, is the most energetic and brave of all, but is delighted to be the one to make coffee and serve rolls to the boys, and to serve the cause primarily as liaison to the adults. The boys have entirely too much freedom... the 'sensibleness' of the more liberal parents is explained frighteningly convincingly. And there's so much good luck that it just seems like a fairy tale. However, if I shut down my negative attitude, I can see that it is fun, funny, charming, and altogether a book that many adult fans of children's classics would indeed still enjoy. Emil and the Detectives centers on a good-natured boy who defies expectations in his honesty, familial piety and determination. 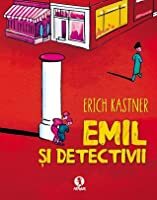 Erich Kastner captures the rambunctiousness and excitement of youth as he leads the readers through the adventures of Emil as he joins with a team of organized street detectives who are mere children as they spy on the man who robbed Emil whilst he slept. Kastner's sense of humor pervades the story from the beginning as he vexes over coming up with a plot, and his sense Emil and the Detectives centers on a good-natured boy who defies expectations in his honesty, familial piety and determination. Erich Kastner captures the rambunctiousness and excitement of youth as he leads the readers through the adventures of Emil as he joins with a team of organized street detectives who are mere children as they spy on the man who robbed Emil whilst he slept. Kastner's sense of humor pervades the story from the beginning as he vexes over coming up with a plot, and his sense of humor keeps the story from drifting into the realm of generic feel-good tales where all will be well. "Because a man can write only things he knows and has seen." A nostalgic hour on ebay left me with a Cathy Dennis cd, a box of panini stickers, and a beautiful 1964 paperback of Emil and the Detectives. On the introduction page it reads "Forward readers of eight could tackle it, while those in their early teens still enjoy it without wanting to disguise the fact" Well i first read when 9 or 10. And 20 years later it is still an exciting and charming read. In fact in those 20 years I have read books as enjoyable as this, but probably not enjoyed anything mo A nostalgic hour on ebay left me with a Cathy Dennis cd, a box of panini stickers, and a beautiful 1964 paperback of Emil and the Detectives. On the introduction page it reads "Forward readers of eight could tackle it, while those in their early teens still enjoy it without wanting to disguise the fact" Well i first read when 9 or 10. And 20 years later it is still an exciting and charming read. In fact in those 20 years I have read books as enjoyable as this, but probably not enjoyed anything more! "Dass es Leute gibt, die immer sagen: Gott, früher war alles besser, das wusste Emil längst. Und er hörte überhaupt nicht mehr hin, wenn jemand erklärte, früher sei die Luft gesünder gewesen oder die Ochsen hätten größere Köpfe gehabt. Denn das war meistens nicht wahr, und die Leute gehörten bloß zu der Sorte, die nicht zufrieden sein wollen, weil sie sonst zufrieden wären." Emil lived with his mother. His father passed away long time ago so Emil's mother worked hard for both of them. One day Emil was going to Berlin. His mother gave him seven pound notes to give to his grandma. In the train Emil lost the money his mother had earned so hard. Emil was determined to catch the thief. With his new found friends, the adventure began. Emil anak yg pengertian. Dia menyadari bahwa hanya dirinya yg dimiliki ibunya, jadi meski akhir pekan atau liburan sang ibu membolehkan Emil dolan dan pulang jam 9 malam, Emil memilih pulang dua jam lebih awal dan makan malam bersama ibunya jam 7. Ketika uang yg didapat ibunya dgn susah payah selama berbulan-bulan untuk diberikan pada nenek hilang, Emil merasa sangat bersalah. Emil juga anak yg tahu balas budi. Dia ingat pria yg membayarinya di tram ketika dia mengejar si pencuri dan tidak punya uang sepeser pun. Emil juga mengembalikan uang yg dipinjamnya dari orang hotel. “Und die Straßenbahn fuhr. Und sie hielt. Und sie fuhr weiter. Emil las den Namen der schönen breiten Straße. Kaiserallee hieß sie. Er fuhr und wusste nicht, wohin. Im andern Wagen saß ein Dieb. Und vielleicht saßen und standen noch andere Diebe in der Bahn. Niemand kümmerte sich um ihn. Ein fremder Herr hatte ihm zwar einen Fahrschein geschenkt. Doch nun las er schon wieder Zeitung.